James Tynion IV’s run ends with this issue. As a longtime fan of characters like Tim Drake, Stephanie Brown, Jean Paul Valley, and Cassandra Cain, I’m so proud of what he was able to do on this book. There’s a reason he’s my favorite modern-day Batman writer. If you want to dive into this series, don’t skip on anything. Go all the way back to Rise of the Batmen. So in last week’s issue, we learned that the heroes “from the main four teams” that aren’t in these makeshift groups are being held in stasis by Brainiac. That’s his fail-safe, apparently. And somehow the only hero of any merit left is Green Arrow. A bit convenient, wouldn’t you say? It does what it’s designed to do, which is explain why no other heroes are around to help. But still. As you’ll see, this was a big Star Wars week for yours truly. I’m still ready for this Mon Cala story to be over. And for someone other than Salvador Larroca to be drawing it. But I’m obviously still forking money down for it. So in the end, they win. The opening scene in this book is downright touching. Expect to see it in Panels of Awesomeness soon. I don’t want to give away much. But it takes place shortly after The Last Jedi, and involves Leia and Chewie. This one is a few weeks old, but a buddy of mine has been on me to catch up on Vader. He wasn’t wrong. This one also takes place on Mon Cala, but it occurs shortly after Revenge of the Sith. It’s a little bit slow at certain points. 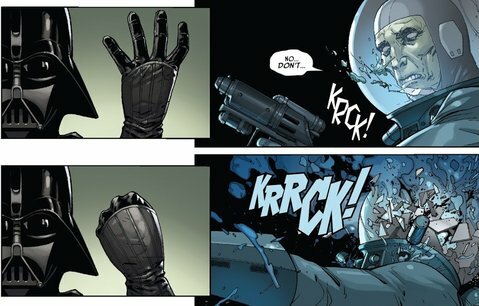 But Charles Soule and Giuseppe Camuncoli know how to deliver the action. If you’re a Star Wars fan, it’s worth the read. This series is actually a reprint of the TMNT stuff Image published in the late ’90s. I’ve always been curious about it, mostly because of the big changes they made to the status quo (i.e. Donatello becoming part-robot). But I haven’t had the chance to read it until now. All I’ll say is, you can definitely tell this is a ’90s Image book. I’m not sure if I’ll keep picking it up. But this one certainly entertained me. I hadn’t even heard about this series. But Steve Niles’ name piqued my interest. After reading the first issue, it seems like there might be something good here. I was hoping for a bit more of a hook. But it’s officially on my radar. I ordered this issue from my local comics shop (Shout out to Rockhead’s Comics and Games in Kenosha). Realistically, I could have bought the trade. Or worse, pirated it online. But I wanted to read it issue by issue. So far, I haven’t been disappointed. 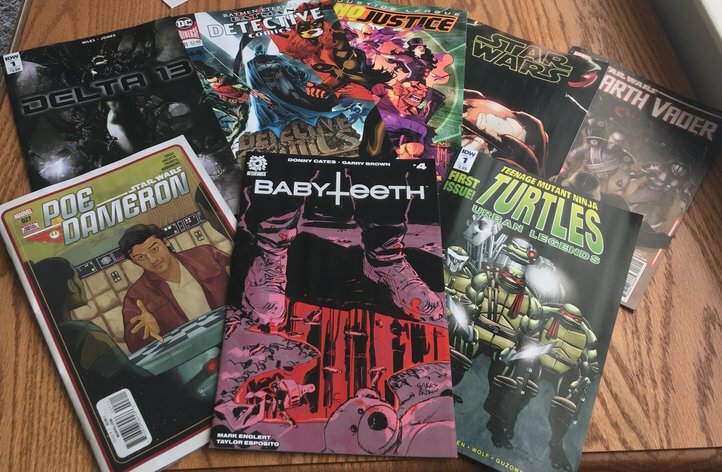 This entry was posted in Uncategorized and tagged Aftershock Comics, Babyteeth #4 (2017), Babyteeth (AfterShock), Darth Vader, Darth Vader #16 (2018), DC Comics, Delta 13 (IDW Publishing), Detective Comics, Detective Comics #981 (2018), Detective Comics Vol. 1: Rise of the Batmen, Donatello (TMNT), Giuseppe Camuncoli, Green Arrow, Image Comics, James Tynion IV, Justice League: No Justice, Justice League: No Justice #3 (2018), Marvel, Marvel Comics, Mon Cala, Poe Dameron, Rob Siebert, Rockhead's Comics and Games, Salvador Larroca, Star Wars, Star Wars #46 (2018), Star Wars (Marvel Series), Star Wars: Darth Vader, Star Wars: Episode VIII - The Last Jedi, Star Wars: Poe Dameron, Star Wars: Poe Dameron #27 (2018), Star Wars: The Last Jedi, Steve Niles, Teenage Mutant Ninja Turtles, Teenage Mutant Ninja Turtles (Image Comics), Teenage Mutant Ninja Turtles: Urban Legends, Teenage Mutant Ninja Turtles: Urban Legends #1, TMNT, Weekly Comic Haul on 05/24/2018 by primaryignition.